In late 2012 we embarked on a major overhaul of our brand, the Virtual Server line-up, and the flagship Cloud VPS product. The end result of this overhaul was the Crucial Cloud Hosting you see today, with it’s current Virtual Server and Blaze Cloud VPS offerings. One of the key drivers for an overhaul of our virtual offerings was the use of a cloud platform called OnApp. OnApp is the back-end software that helps drives the ease of use, automation and features that make up our Blaze Cloud platform and Virtual Server platform. OnApp is also commonly known as cloud management layer software. 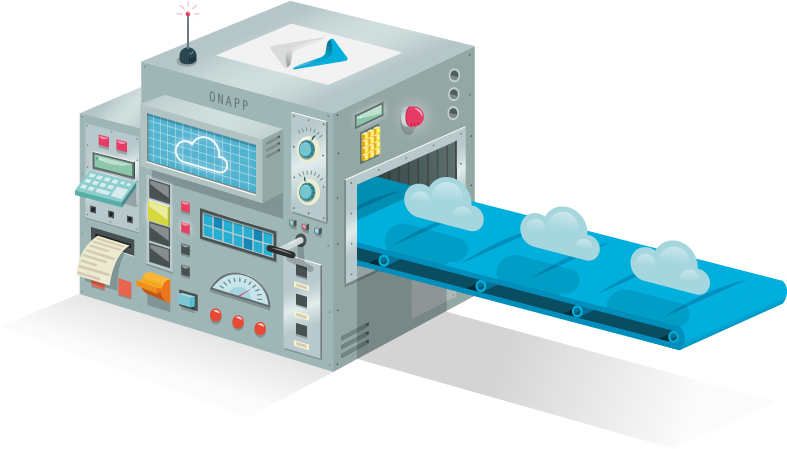 OnApp is an IaaS (Infrastructure as a Service) platform/software solution. In terms of feature rich hosting, OnApp provides support and functionality for a number of different services. This is just limited to the Virtual Server, Blaze Cloud, Blaze PAYG offerings we use OnApp for, other such items include support for Dedicated Servers, CDN, Storage and other great services. Although we don’t use those features at present! From the automation and efficiency perspective, OnApp is specifically designed to automate or simplify all actions within it’s control panel. It also has a full featured API which allows you to build your own automation from say, your billing system (OnApp does have modules from some common billing systems such as WHMCS). The user experience is key to this as the control panel is not only simply and user friendly, but is the ideal self-service portal for customers and administrators alike to manage their clouds. Crucial’s vision is to make the web easy and reliable. One of our key company values is to be customer centric. And so with our vision and values in mind, along with a list of areas we wanted to improve on we began our search. There were a number of others, but they were either filtered out of the list quickly or lacked the documentation nor were reviewed extensively. Soon after we were able to shorten the list as both Virtualizor, and SolusVM did not support any sort of HA (High-Availability) feature, although they had great user friendly control panels. We ruled out Cloudstack, Openstack and Nimbula due to them not being OTS (off-the-shelf) type solutions. Whilst we strive to be a technology based company, we have to be quick and flexible in our approach to change. So off-the-shelf integration was critical to our decision. In the end we were left with Flexiant and OnApp as our final candidates. At the time of our review Flexiant was positioned as an enterprise cloud platform, and the pricing model was not suited for hosting providers such as Crucial. This allowed us to rule out Flexiant and focus our energy on confirming OnApp as the ideal solution. I believe since then Flexiant has adapted due to OnApp’s greater commercial success in the industry. We didn’t simply read the documentation and leave it there however. Doing a thorough due diligence is critical to the success of key decisions in any business. We spoke directly with OnApp providing a lengthy list of requirements to which OnApp provided detailed responses. We ran a number of trial OnApp environments to verify the documentation provided by OnApp and our team combed over various peer reviews within the industry, listening to feedback from key hosting personal from around the world. We even went to the HostingCon industry conference in the US in 2012 to speak directly with the CEO and CTO of OnApp. We did some further research and found providers whom were already using OnApp, we signed up for their services and gave them a test run. This gave us some clever insights into how other companies were utilising, implementing and selling their services using OnApp. To build on this, OnApp itself is just software, you still need to consider all the infrastructure required to run the OnApp solution, and how that fits into your business. We already had a tried and tested HP Blade System that we knew well, so our initial testing of OnApp was around using it on that. However the next big decision is storage, most precisely what SAN solution are you going to use in conjunction with OnApp. However this specific blog article is about OnApp, so I won’t stray off the path too much. We ultimately decided upon the SolidFire SAN storage solution which complimented the OnApp solution well as both were API driven. And thanks to a synergy between OnApp and SolidFire, we were able to pioneer some great new features exclusive to Crucial customers. Once we reached our final decision, and signed a few agreements, we began the planning and testing phase of our OnApp deployment. Ultimately it came down to this simple concept: we are here to make web hosting easy and reliable for our customers. We are not developers at heart, so lets implement a solution and stick to what we know, and do it better than everybody else. All whilst providing the best possible solution to our customers to get them the results they desire. In my next blog post I will be diving into the planning and testing phases of our OnApp deployment. Whilst an off-the-shelf solution, we still needed to know the solution like the back of our hand. If you have any questions about why we chose OnApp, feel free to leave a comment and I’ll get back to you. Ross, Nice blog post and great to see that you focused on not just the technology, but the time to market and customer experience. You are correct in your assessment that the Flexiant pricing structure in 2012 was not ideal for the service provider market. We changed that in November 2012 after talking with prospects and listening to the market. Now the Flexiant software can be bought from as little as $8 per core/month. Congratulations to your business and a pity we never got the opportunity to compete for your business. Hi George, Appreciate the comment and the feedback. I have definitely seen Flexiant increase its presence in this space through events like Hosting Con. This year should be an interesting one for the cloud space. This is much helpful blog, I really prefer this cloud computing points.